A previous study sponsored by the Smart Work Zone Deployment Initiative, ?Feasibility of Visualization and Simulation Applications to Improve Work Zone Safety and Mobility,? 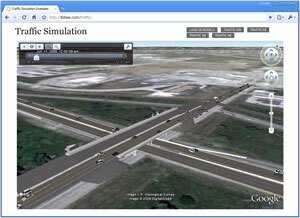 demonstrated the feasibility of combining readily available, inexpensive software programs, such as SketchUp and Google Earth, with standard two-dimensional civil engineering design programs, such as MicroStation, to create animations of construction work zones. The animations reflect changes in work zone configurations as the project progresses, representing an opportunity to visually present complex information to drivers, construction workers, agency personnel, and the general public. The purpose of this study is to continue the work from the previous study to determine the added value and resource demands created by including more complex data, specifically traffic volume, movement, and vehicle type. This report describes the changes that were made to the simulation, including incorporating additional data and converting the simulation from a desktop application to a web application.